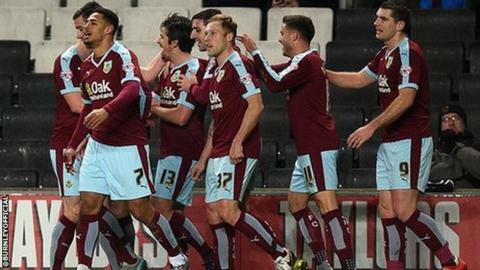 Burnley thrashed MK Dons to move up to fourth in the Championship and increase the Dons' relegation worries. Joey Barton slotted the Clarets ahead, before Sam Vokes doubled the lead 28 seconds after the restart. Andre Gray headed a third before Matthew Lowton rifled into the top corner. Antony Kay was then sent off for hauling down George Boyd, who duly completed the rout after a flowing counter-attack. The Dons had started the game brightly, with Rob Hall curling an effort just over after being played in by Ben Reeves. But the game turned when Dean Potter was robbed by Barton and the midfielder advanced into the area and beat David Martin for his first Burnley goal. And the hosts' hopes of getting back into the game in the second half were immediately wrecked when Welsh international Vokes broke away and ran clear before sliding the ball into the corner of the net. Gray added his fifth goal in five games before Lowton and Boyd compounded the Dons' misery. It was a first win in six away games for Sean Dyche's side, who remain the only Championship side yet to drop a point from leading positions this season. "I think that it's important we use this night in a very positive way. The fans are disappointed and the players are too, but we will use it as a driver and a motivator. "The players are sat in there embarrassed and rightly so, equally as much as I am embarrassed, but how you respond to results like this is what determines how you are as a man. "Do you stand there and let it knock your confidence and reject you to the point where you want to shrivel up and hide, or do you want to put on your armour and your shield and stand there and take the criticism and move forward and galvanise this stadium? That's what we need to do." "I was pleased with the second half and not just with the second goal but the way we controlled the game and set the tone with a lot of good play and organisation. "We didn't come here expecting an easy ride by any means and I was pleased with the professionalism of the players to show that. "I think that we're a strong outfit, we believe in what we are doing, the players believe in what they are doing and I think that was on show. "It was a reminder the players want to play and we are up for the fight. We know how tough this division is and we showed that fight tonight." Match ends, MK Dons 0, Burnley 5. Second Half ends, MK Dons 0, Burnley 5. Attempt missed. Rouwen Hennings (Burnley) left footed shot from the left side of the box is too high. Assisted by Tom Heaton. Simon Church (MK Dons) wins a free kick in the attacking half. Jake Forster-Caskey (MK Dons) wins a free kick in the defensive half. Goal! MK Dons 0, Burnley 5. George Boyd (Burnley) right footed shot from the right side of the box to the top right corner. Assisted by Andre Gray. Offside, Burnley. Stephen Ward tries a through ball, but George Boyd is caught offside. Corner, Burnley. Conceded by Kyle McFadzean. Attempt blocked. David Jones (Burnley) left footed shot from outside the box is blocked. Assisted by Scott Arfield. Antony Kay (MK Dons) is shown the red card. Substitution, MK Dons. Jake Forster-Caskey replaces Robert Hall. Substitution, Burnley. Fredrik Ulvestad replaces Joey Barton. Goal! MK Dons 0, Burnley 4. Matthew Lowton (Burnley) right footed shot from the centre of the box to the top right corner. Assisted by George Boyd. Attempt blocked. Sam Vokes (Burnley) right footed shot from outside the box is blocked. Assisted by Joey Barton. Offside, MK Dons. Kyle McFadzean tries a through ball, but Daniel Powell is caught offside. Attempt saved. Josh Murphy (MK Dons) left footed shot from outside the box is saved in the bottom left corner. Assisted by Jordan Spence. Attempt missed. Samir Carruthers (MK Dons) right footed shot from outside the box is high and wide to the left. Assisted by Dean Lewington. Goal! MK Dons 0, Burnley 3. Andre Gray (Burnley) header from the centre of the box to the centre of the goal. Assisted by Joey Barton with a cross following a set piece situation. Substitution, MK Dons. Daniel Powell replaces Ben Reeves. Attempt missed. Josh Murphy (MK Dons) left footed shot from the left side of the box misses to the right. Assisted by Robert Hall. Substitution, Burnley. George Boyd replaces Michael Kightly. Offside, MK Dons. Josh Murphy tries a through ball, but Nicky Maynard is caught offside. Attempt blocked. Josh Murphy (MK Dons) right footed shot from outside the box is blocked. Assisted by Dean Lewington.